Crossing Boundary Pass, we say goodbye to Canada’s Gulf Islands and enter US waters. We call Customs for our clearance back into the U.S.A. With our NEXUS card this is incredibly easy. In order to get this card, we underwent a background check and a face to face interview with both Canada and U.S. Customs earlier this year. Now that we have the NEXUS clearance we can cross both borders by phone instead of personally appearing at a border check point. Thank you Canada and USA. The San Juan Islands are our destination for the next two weeks. Cruising in this area is so enjoyable. The islands are well protected from Pacific storm surge and most anchorages are well sheltered from any winds. The scenery is beautiful. 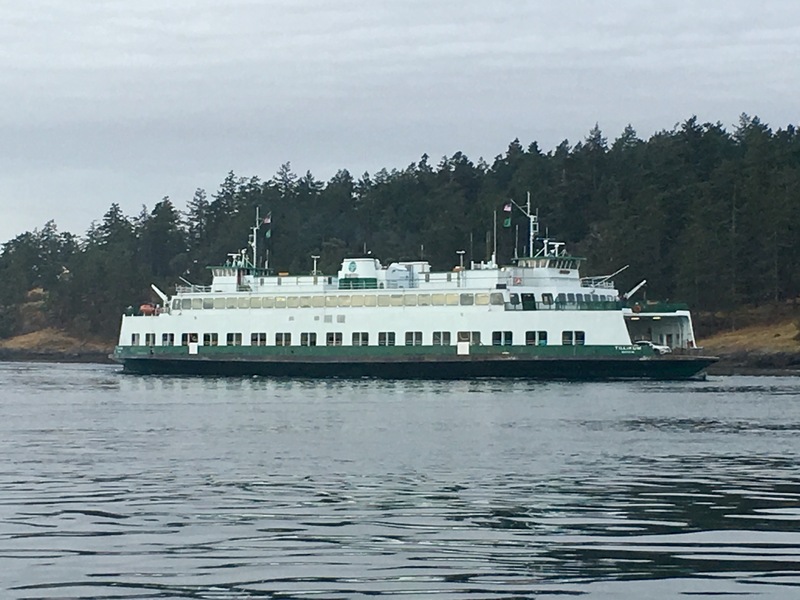 Our only worries are the big green and white Washington State ferries that ply these waters. You must keep a constant watch as these guys are everywhere and fast. Our first stop is Reid Harbor on Stuart Island where we spend two nights at anchor. Eighty eight acres of this island are part of a Marine State Park. The remainder of the island is private with about 50 year long residents. We hike three miles to the Turn Point Lighthouse with a brief stop at the schoolhouse and island t-shirt kiosk. This is a self service honor system t- shirt stand operated for many years by a local resident family. It has become a tradition among boaters to purchase one of these unique t-shirts. 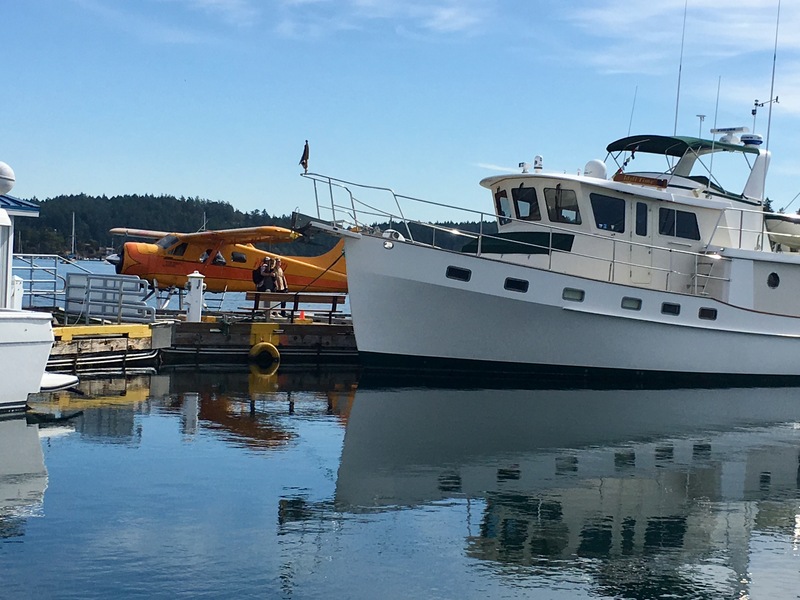 Saying goodbye to Stuart Island, we have a short passage down Lopez Sound to Hunter Bay on the southeastern side of Lopez Island where we set the anchor for two nights. While here we dinghy in to the public dock with our bikes. Lopez is know to be the island for biking as it has fewer hills than the other islands. Our destination is the Lopez Island Bakery in Lopez Village. It is a beautiful 10 mile bike ride through the rolling farmlands. Arriving at the bakery, we see a sign on the door stating “ closed Tuesday, Wednesday, and Thursday”. Today is Tuesday! What a disappointment. Oh well, the coffee shop is open and also serves fresh pastries. While here, another customer gives us a tip that the Orcas were spotted south of town at Shark Reef. We quickly head there on the bikes only to find no Orcas. Just or luck! it is a beautiful spot however overlooking Cattle Pass. 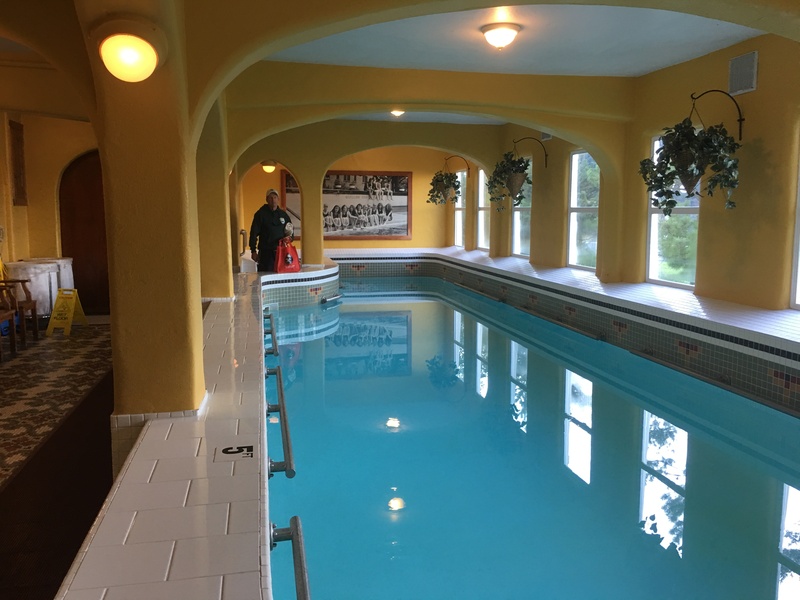 Rosario Resort on Orcas Island was our next destination in the San Juan’s. 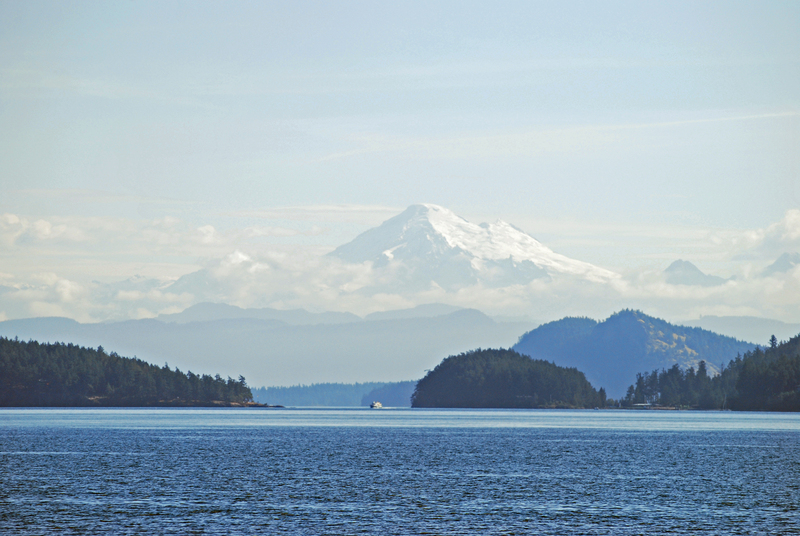 Orcas Island is the largest island in the San Juan Island chain. 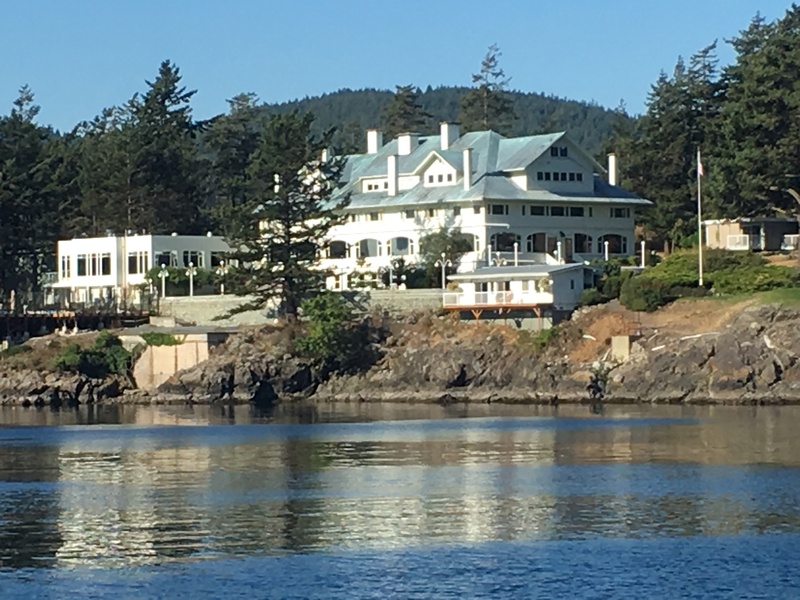 The resort was built in 1904 by Robert Moran, a Seattle shipbuilder. The mansion has now been converted into a beautiful resort and spa and is listed on the National Register of Historic Places. Marina guest can us the heated pool, spa, and sauna for $10 per day. What a deal! 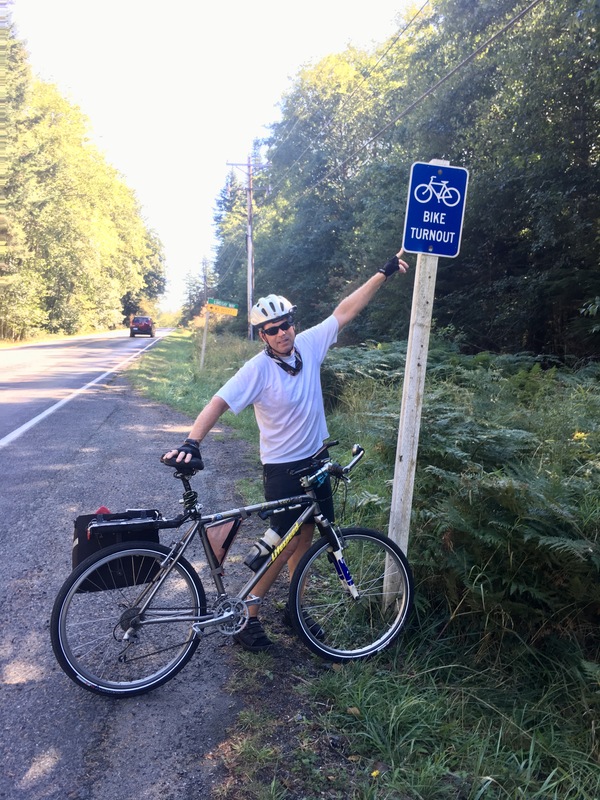 While here we decided to bike into the small main village of Eastsound, 10 miles from Rosario. 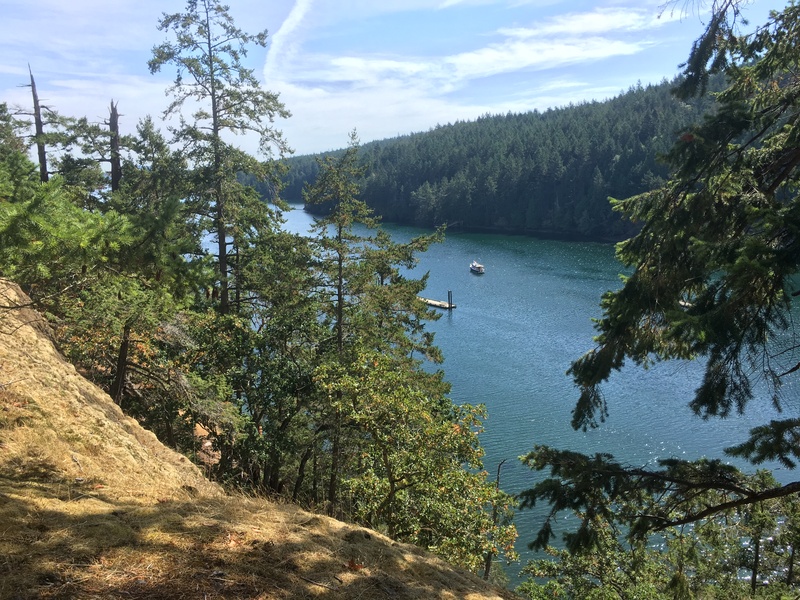 Did we mention Orcas Island is extremely hilly! I don’t believe there is a flat spot on the island. In spite of the hills, we enjoy visiting the numerous galleries, gift shops, and bakeries in the village. Our spa membership was greatly appreciated at the end of the day. 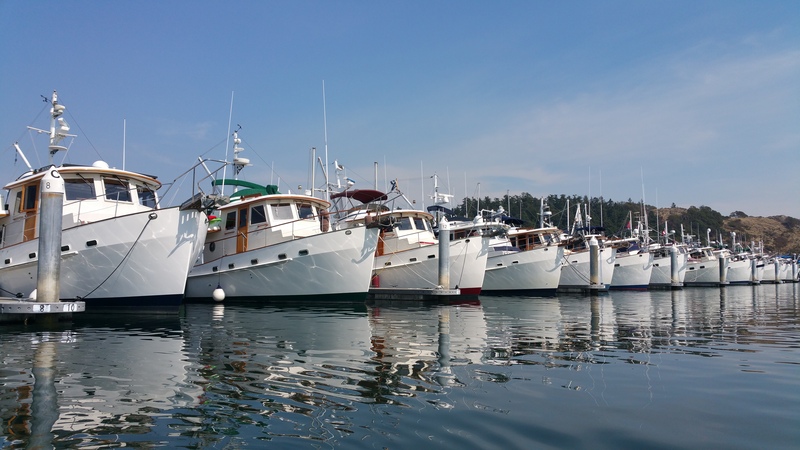 For a few days we take a much anticipated detour to Anacortes for the annual Krogen west coast Rendezvous known here as the “Krog – In” . 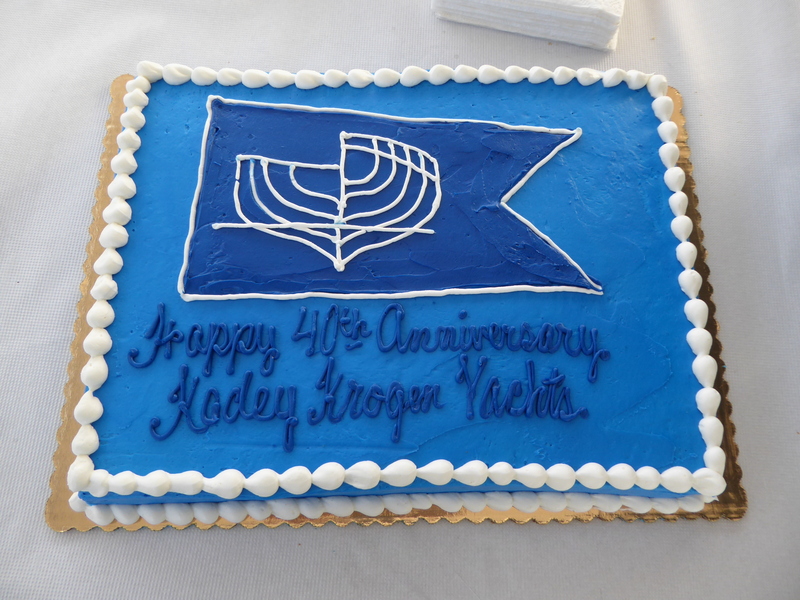 This years gathering is the largest Rendezvous to date with 32 boats in attendance and 41 crews represented. It is a great chance for us to get acquainted with the west coast Krogen family. Several seminars were held including one on shipping your boat given by our three east coast boat captains who shipped This Year, Jeff, Day, and Leigh. The highlight of the event was an art auction to raise money for next years event. Our friend Wendy on Forever Exploring graciously donated two of her beautiful watercolors. 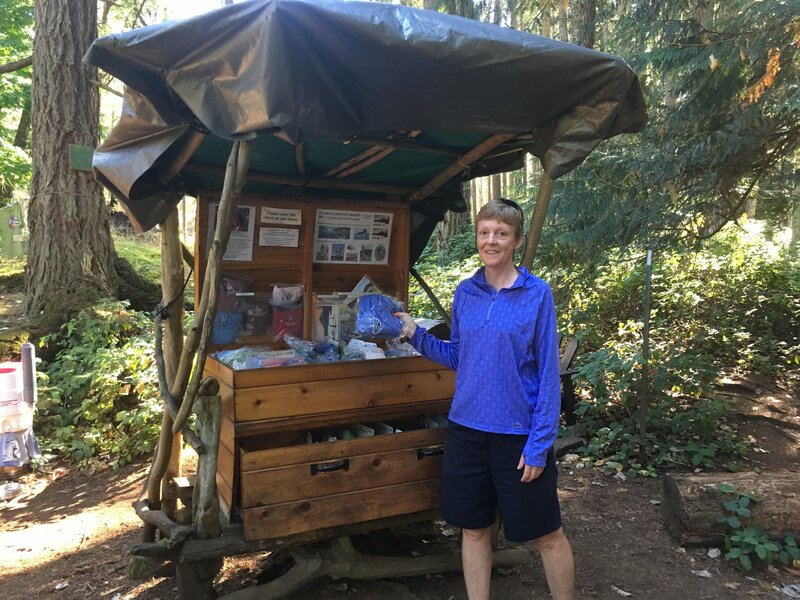 Thanks to her generosity, the west coast chapter treasury was tripled. Thank you Wendy! We look forward to next years event on Bowen Island, British Columbia. Friday Harbor on San Juan Island is our next stop. We have a front row seat right across from the seaplane dock in this busy harbor. The sea planes and ferries are in constant motion bringing tourists to the island. This is another great island for touring by bicycle. 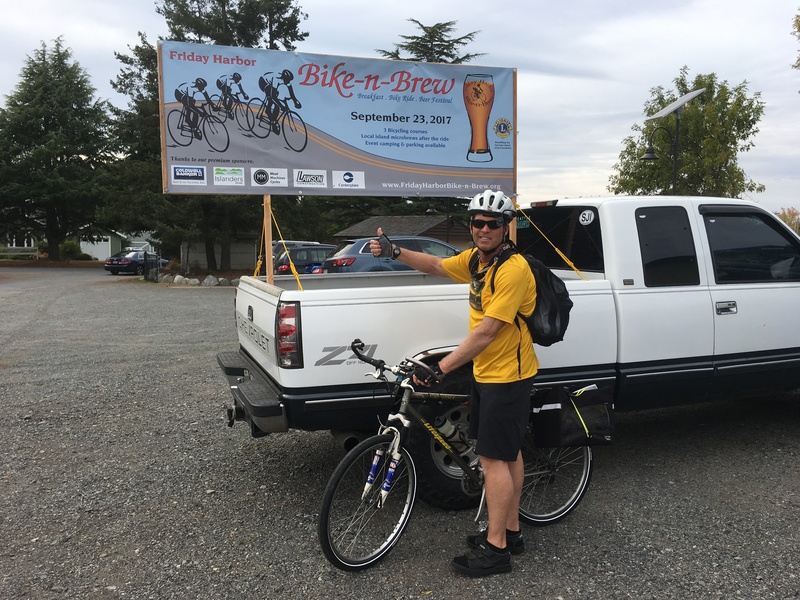 While riding our bikes through town, we spot some signs for a “ Bike and Brew Bike Ride” which is occurring on the island tomorrow. We are soon signed up and the next morning enjoy a great ride through a varied topography of farms and fields, forests, and rocky shoreline while biking the thirty miles around the island. 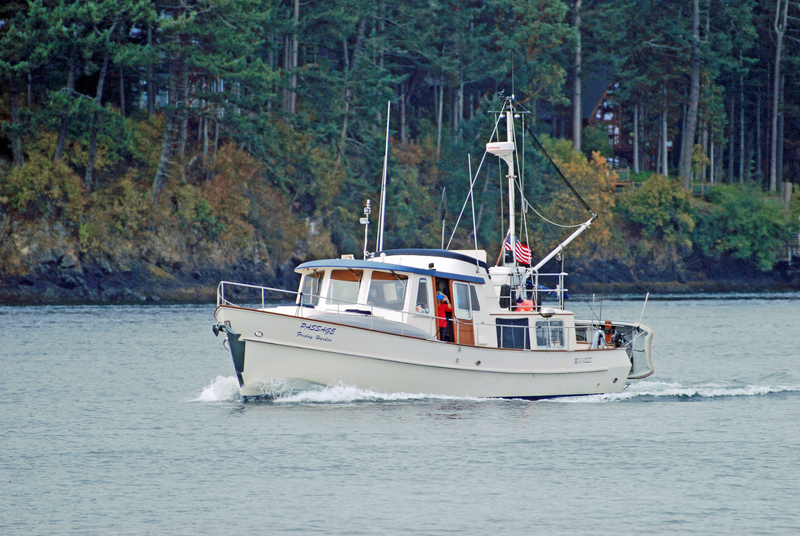 From Friday Harbor we motor to the North side of San Juan Island and anchor off the docks of Roche Harbor. A highlight of the day was crossing wakes with our friends Barb and Brian aboard M/V Passage. They have been extremely helpful and generous sharing their wealth knowledge of these “new to us” waters. If it were not for them we never would have been able to explore as much as we did this year. Thanks again Barb and Brian!! 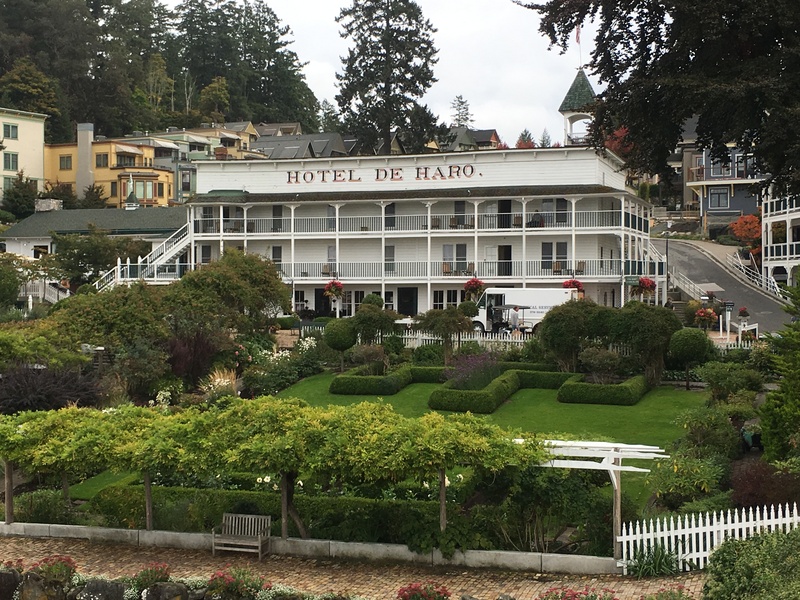 We spend three nights anchored just off the marina breakwater and historic Hotel de Haro. We dinghy into Garrison Bay to visit the National Park which was the site of the British military camp during a border dispute in the 1860’s with the U.S known as the Pig War. 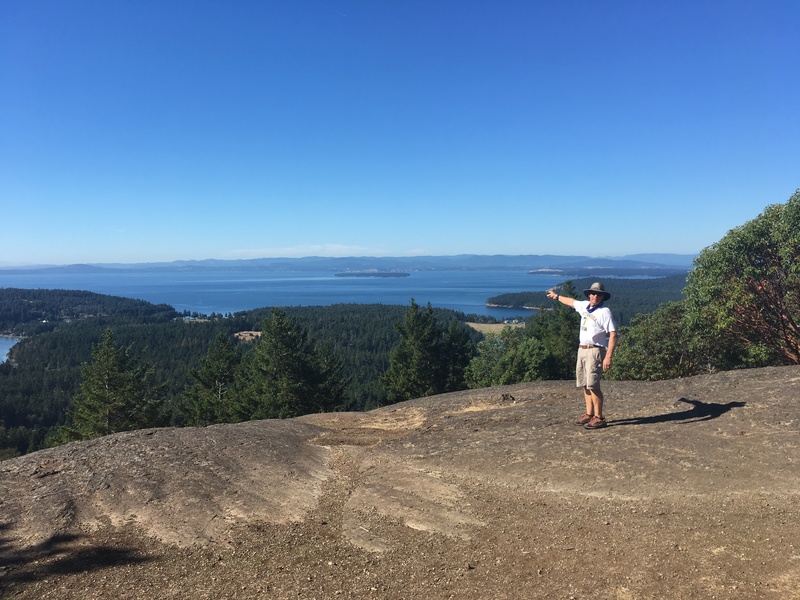 Here we hike to the highest point of Young Hill where we have some outstanding views of Vancouver Island, Haro Strait, and the Olympic Mountains. With rain and wind forecast over the next few days, we take advantage of a wonderful weather window to cross Haro Strait. With our Nexus Card we are soon cleared back into Canadian waters and on our way back to the charming town of Sidney on Vancouver Island. This entry was posted on October 11, 2017 at 12:45 am. You can follow any responses to this entry through the RSS 2.0 feed. You can leave a response, or trackback from your own site. 1 Response to "San Juan Islands"
Thanks for the shout-out! Unfortunately, our photos of Idyll Time didn’t turn out as well. Looking forward to seeing you in 2018!